The countdown is on. 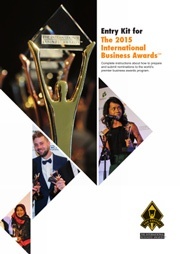 The extended final entry deadline of The 12th Annual International Business Awards is July 15. Organizations and individuals worldwide have eight days left in which to compete for the Stevie®, the highest honor in the business world. The International Business Awards attract more than 3,500 nominations from organizations in more than 60 nations and territories each year. Gallagher emphasizes that it’s possible to create high-quality nominations in the time remaining to entrants. Interested organizations may get the entry kit and other details at www.StevieAwards.com/IBA and select the categories suitable to their achievements. “The heart of each entry is an essay of up to 650 words, describing the nominee’s achievements since the beginning of 2014. The more precise and compelling the story of those achievements, the better.” advises Gallagher. He also emphasizes that no additional late fees will be charged for entries submitted through July 15, and late entries will not be penalized in any way in the judging process. Gold, Silver and Bronze Stevie Award winners will be selected during the judging process by more than 200 professionals worldwide. Winners will be announced on August 12, and the awards will be presented at a gala awards ceremony at the Ritz-Carlton Hotel in Toronto, Canada, on October 23. The Stevie Award trophy, made by the same company that manufactures the Oscar, is one of the world’s most coveted prizes. Learn more about The International Business Awards and the benefits of entering in a short video interview with Michael Gallagher.